Viceroy Kraw is invited to witness whatever prediction the ShadowCaster has brought to Incendium, along with King Ouros and Queen Ignita. Although the royal couple can make little sense of the vision shown by the strange creature, Kraw knows his family’s ancient betrayal has to finally be revealed to the dragon kings. Will the fury of Ouros be as fierce as Kraw fears? What will be the future of the viceroy? Kraw's Secret is a short story in the Dragons of Incendium series. It should be read after Wyvern's Warrior and before Wyvern's Outlaw. It is available in this digital edition and also included in the trade paperback The Dragons of Incendium: The First Collection. I just finished reading this story July 20, 2017. This is my review. This story is a short story in this series and is NOT to be read as a stand alone. The context of the story is meant to be read as part of the whole series and would not make sense on it's own. This series is a set of novellas and short stories, alternating each story. This story is the 3rd short story and takes place after book 3 "Wyvern's Warrior." In this story, we have Kraw, the viceroy to King Ouros and Queen Ignita of Incendium. 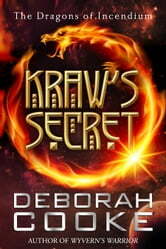 A treasonous secret is revealed about Kraw's ancestors which will affect the future of his family. The position of viceroy has been passed down from father to son in the family for generations but Kraw has no children and must now find an apprentice. He's hoping his nephew Arkan will be the new viceroy. Kraw is just waiting for the right sign to know Arkan is ready. Lots of intrigue and mysterious secrets are revealed in this short story. A hint of a relationship is given between Arkan and Princess Enigma. We are also reminded that Princess Anguissa is still missing. More teasers are given as to what may happen in the next book as to what is happening with the Hive. And if you have no idea what I'm talking about? That's why you have to read the whole series to know what's going on in this story! LOL! These in between short stories are like teasers to future books, just a taste of what's to come. Fun and quick to read. I look forward to reading more of this series. This was a well-written, enjoyable short story. The King and Queen of Incendium have invited Viceroy Kraw to witness the Shadowcaster's prediction. When he sees it he knows it reveals his family's ancient betrayal. How will the King and Queen react? What will happen to the position of Viceroy? This can be read as a standalone story, though it is part of the Dragons of Incendium series. This was a great story and I look forward to reading more books in the series as well as other books by this author. Copy gifted by the Publisher. I am voluntarily posting an honest review.